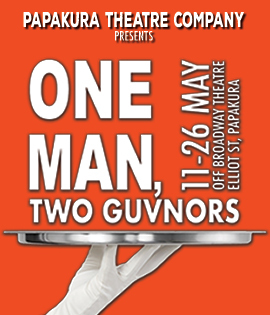 ONE MAN, TWO GUVNORS is a fast-moving, physical comedy which we are sure will have you laughing from beginning to end! This uproarious play was a runaway hit in London’s West End and on Broadway, with James Corden playing the lead role of Francis Henshall and winning both an Olivier and a Tony Award. It's 1963 and Francis has been fired from his skiffle band and finds himself in Brighton. He is hired as a minder to ‘Roscoe’ Crabbe, a small-time East End hood who is in town to collect a debt, But the always- hungry Francis sees an opportunity to earn a few extra bob by taking on a second job working for Stanley Stubbers, who is hiding from the police after killing ‘Roscoe’. So Francis finds himself serving two guvnors but must keep them apart – and so the fun begins. However, there are a few little surprises along the way! Is ‘Roscoe’ really Roscoe? Where’s Roscoe’s sister, Rachel? And who will Pauline end up marrying? And will Alfie manage to serve the drinks without spilling them everywhere? And just how does Francis manage to handle two jobs without either guvnor finding out? Is he likely to get confused? Probably!! And does he end up with the girl? Hopefully! And what’s the beer like at The Carpenter’s Arms? And will they all sing from the same song sheet at the end? Oh heck - let’s hope so! Bookings also available in person at Off Broadway Box Office from 4 April 2018 – from 11 am to 2.00 pm Wednesdays and Saturdays only.